This dresser was orignially a plain white dixie dresser which was first painted a gloss navy blue, and then hand painted with gold flowers. The pattern of the flowers was taken off of the IKEA pattern from their carboard storage boxes. The dresser turned out fabulous! This piece I painted myself. This website is a blog of painted furniture I find inspiring. I would suggest finding painted furniture on ebay, there are large amounts of hand painted furniture. With this chest I copied an IKEA storage cardboard box. 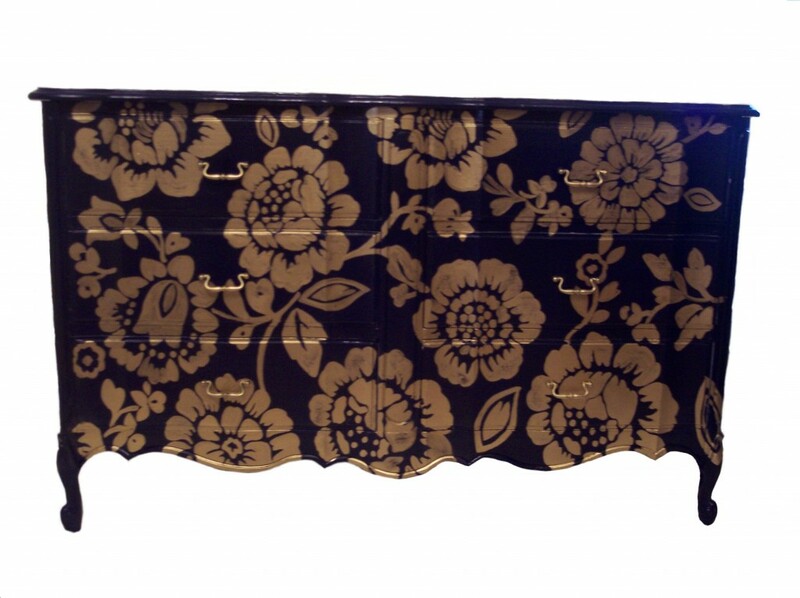 I traced it on to the dresser, and then I painted in the design with gold paint. It was lovely. I did it just for this site. I always loved the color blue, and getting it on to this piece was the most difficult part. After many coats, the blue wasn’t covering that I had to spray paint it. It did turn out lovely, so I thank you for all the complements.